The gist: You can learn skills by imitating those who’ve already mastered them. But mastering them yourself takes creativity and hard work. When it comes to cooking, I know how to make a few things. There’s a list of recipes I stick to and if all the ingredients are available and I’m in a familiar kitchen I can make dinner. I’m certainly no chef. Even cook would be a stretch. What I am is a man who knows how to follow instructions. If the directions are well written and nothing goes wrong, you’ll get something edible at the end. My wife, on the other hand, is a culinary genius. Everything she makes is exceptional and, if she follows a recipe, it’s one she created herself. Missing ingredient? No problem; she knows what to substitute. Working with a new oven? She can watch her dish for signs it’s ready. These are skills I do not have. If you were to describe the difference between my wife and I, you could say that I know how to cook, but she understands food. I’m an imitator, she’s a master. If you want to build a useful skill that will serve you for a lifetime, you have to bridge the very wide gap between mimicry and mastery. What’s different about them? One’s a little lighter than the other. The composition of the bed the woman is sitting on is slightly different. Really, though, they’re about the same. Each was created by a hand with similar technical skills. The real difference is that one is an original Matisse, and the other is a fake created by someone who stole the original from a museum. If we’re just talking about the image, it doesn’t really matter who created it, does it? Either one would look fine above the dining room table you only eat at when important guests are over. But the minds that created these two pieces are very different. And what they represent are different, too. One of these paintings represents years of painstaking thought, practice, and dedication to creativity. The other represents taking shortcuts. If you sat the two creators down and asked them to paint you something new, one would be able to do it. The other would have to wait until the first was finished so he could copy it. Where the imitator knew how to wield a paintbrush and trace a stroke, Matisse understood how to wield his mind. Inside his head was an explosion of ideas. Not just ideas, but ideas he could execute. And if he made a mistake along the way, he understood the creative process enough to adjust and still come away with a beautiful piece. Just like me in the kitchen, the imitator only knew how to follow a recipe, and recipes only work when all the pieces you don’t control fall into place. 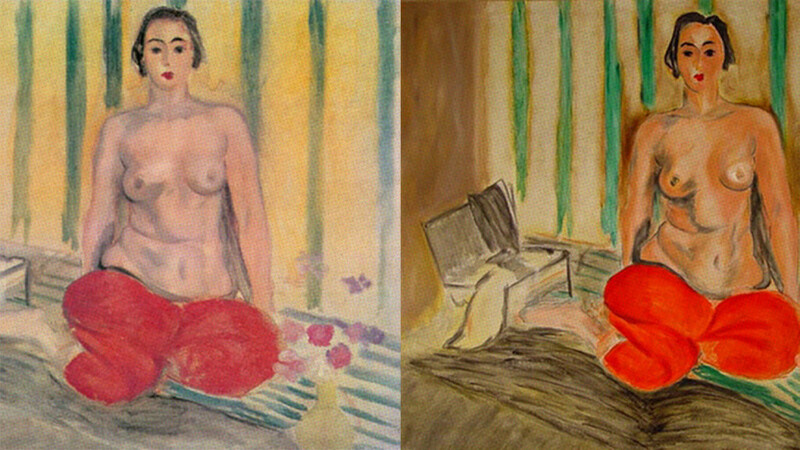 If you could choose to be more like Matisse or the imitator, who would you pick? Imitation isn’t bad. It’s how we learn, after all. We walk by watching other people walk. We talk by repeating what our parents say. If you want to learn how to do something, the fastest way is to copy someone who’s already doing it. Matisse was probably an art forger himself as a child—copying the artwork he enjoyed. 1. They’re never fully satisfied with their work. If it’s a fool’s errand to only accept perfection, it’s a sloth’s errand to accept mediocrity. Those who make the leap from knowledge to understanding are the ones who can celebrate their wins while recognizing they can still do better. 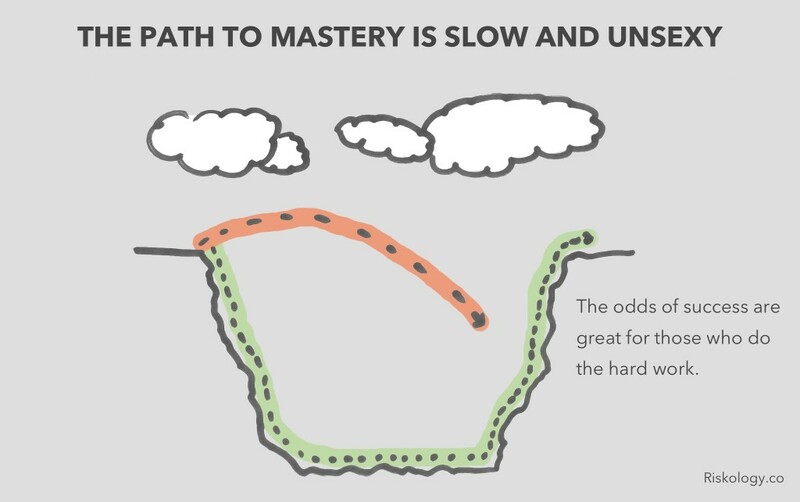 The path to mastery is paved with hard work that’s never truly done. 2. They understand the power of tiny gains. The fastest way to burn out on the road to mastery is to expect too much from yourself too quickly. 3. They’re not afraid to create junk. Success takes time and repetition. When you’re at the beginning of your journey, you’re bound to create a lot of junk. Those who complete the journey embrace this. They aren’t satisfied with the junk they create, and they see the opportunity to make the small improvements that will add up to something great if they keep iterating. These are the concepts that, when repeated, will take you on your journey from imitator to creator. They are the keys to mastery. Whether you’re a runner who wants to be a master athlete, a coder who wants to become a master programmer, a wantrepreneur trying to build a business empire, or something totally different, this is the mindset that will take you there. That’s what will help you cross the gap. Will you put in the effort and trust the process?